I believe the original meaning of this word Shitsuke is used in the context of teaching children and it means manners and discipline. In Japanese, it is written as 躾. In the context of the work place, I would define Shitsuke as discipline. It means Conforming, or “doing what’s been is decided”. I have taken this definition from a passage that I came across in a book entitled; The Canon Production System, Creating Involvement of the Total Workforce by Alan T. Campbell. "Canon has benefited in two important ways through the 5S Movement. First is the workers’ change in consciousness - a readiness to follow rules and “do what’s been decided”… For example, keeping parts and tools in their place was once a hard rule to enforce. It is never broken now; this reduces delays and wasted motion and helps visually control the workplace. The second benefit can be seen in the manufacturing process itself, in fewer accidents and equipment breakdowns, increased work efficiency, and lower defect rates." This definition implies that Shitsuke is something that comes from within a person. It is more than simply following rules and regulations. It includes unwritten rules and basic courtesies and consideration for others. And it is something the person will do as a habit, without having to be reminded. For example, I often meet clients in their premises. Sometimes, to the embarrassment of the host, we find that the whiteboard in the meeting rooms are quite dirty and there’s writing left on the board from a previous meeting. This is so even in many office blocks which are being kept clean by cleaners. Although there are no written rules which say that the user should clean the whiteboard after use, it is something that is ‘understood’. In this regard, I think of something that I find quite shameful as a Singaporean. There was a time when I often see stickers in public toilets warning of a fine of $500 if you did not flush the toilet after use. 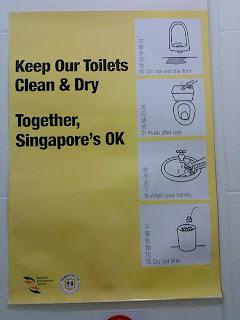 As a Singaporean, don’t you feel ashamed that our authorities need to put up posters reminding us to keep our toilets clean and threaten people with a fine for doing something that should come automatically; and in the process live up the our reputation of being a ‘fine city’. 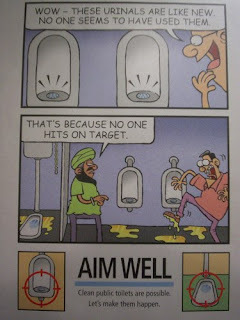 Anyway, this threat apparently did not work and so nowadays, they have installed auto-sensors to flush the toilets automatically. Alas, this measure has become counter-productive because in many public toilets, especially those in our kopitiams (coffee shops) these sensors do not work. Consequently, the toilets become even dirtier and smellier than before. I am very much tempted to put up a photo of one of these typical toilets here, but I think I will spare you the dear reader of the torture. As members of an organisation, we have a basic responsibility to be considerate, and to cooperate with and even care for the safety and welfare of our fellow workers. This is the heart of Shitsuke. In the beginning of this blog, I wrote about the littering problem in Singapore and compared ourselves with the Japanese. Have you ever wondered why the Japanese are able to do what we have been struggling to achieve for so many years? I think the answer lies in the homes and the schools. I will elaborate next time.